Opposition leader Sam Rainsy yesterday said that up to a quarter of a million ethnic Vietnamese living in Cambodia could be granted full citizenship rights via the Nationality Law if his Cambodia National Rescue Party were to come to power. The CNRP president has sought in recent months, through a flurry of letters to newspapers and online postings, to cast off what he calls a groundless “foreign-entertained allegation” of anti-Vietnamese sentiment levelled at him and his party. His most recent comments regarding the citizenship rights of some ethnic Vietnamese come after the Cambodian People’s Party-led government announced the creation of two new departments in the Ministry of Interior to control immigration and the issuance of identity documents. The CPP’s platform for next month’s councillor elections also promises to address problems related to immigration and make it easier for identity documents to be obtained by those who require them. The moves have led analysts to conclude that the ruling party is trying to catch up with public opinion regarding long-term unchecked illegal immigration from Vietnam, a hot-button issue for many who voted for the CNRP – which has talked about the issue extensively, despite it not appearing on the party’s policy platform – at last July’s disputed national election. Speaking with the Post yesterday on the phone from Europe, where he is due to attend a political party conference in the Netherlands next week, Rainsy said he believed there were around 500,000 people “of Vietnamese descent” living in Cambodia, half of whom were eligible for Cambodian citizenship via birth. “According to me I think that up to half of these 500,000 people of Vietnamese descent fulfil the legal requirement to be considered as Cambodian citizens. So the CNRP, we must treat those who meet the requirement to be Cambodian citizens, as Cambodian citizens,” he said. The 1996 Nationality Law outlines that Cambodian nationality can be obtained by anyone born in Cambodia to foreign parents, if they too were “born and living legally” in the Kingdom. But rights groups say it would be difficult for many immigrant parents to prove legal residence, given the state of Cambodia’s legal and administrative system. In line with the laws, the CNRP wishes to “curb illegal immigration” but from a legal humanitarian standpoint, Rainsy said. While many Cambodians are fearful and suspicious of Vietnam due to historical grievances, a feeling “hastily, unfairly and inaccurately” attributed to racism by many foreigners, the CNRP would work to educate the public to respect ethnic Vietnamese citizens, Rainsy says. “We will educate Cambodian people as a whole to respect those people . . . Those who were wrongly considered as foreigners. We must educate Khmer people, these are Khmer citizens as you and I and we must respect their rights,” he said. 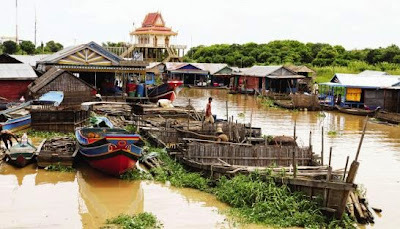 According to Ang Chanrith, executive director at the Minority Rights Organization, most ethnic Vietnamese were born in Cambodia do not possess citizenship, “except those who are rich or well connected”. In comparison to Rainsy’s figure of 500,000, Chanrith estimates that about 700,000 ethnic Vietnamese live in Cambodia, but he said there is no solid data on population figures or what proportion of the group were born in the Kingdom compared to those “who come for political and economic purposes”. Chanrith said that he hoped the government’s new commitment to improving immigration oversight was genuine, and not just to gain votes. According to its political platform for next month’s council elections, the CPP is promising to “resolve the problem of immigrants, control immigrants and more effectively resolve the problem of crimes [committed by foreigners] in accordance with the existing laws”. Cheam Yeap, a senior CPP lawmaker, said his party is committed to implementing existing laws and controlling immigration flows “for the benefit of the nation”. “We are the ruling party and the government is paying strong attention to control immigration in order to avoid criticisms from the people and the opposition party,” he said. Ministry of Interior spokesman Khieu Sopheak last week said that a new general department of immigration would allow the government to increase its capacity to process migrant applications with greater oversight from the ministry. Veteran political analyst Lao Mong Hay said yesterday that while it was clear the CPP was “trying to catch up with public opinion” and gain lost votes with the new measures, the opposition was also courting voters – ethnic Vietnamese ones – by promising citizenship for those who are eligible.